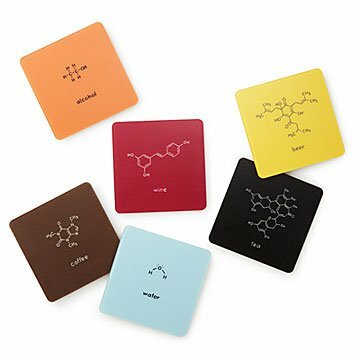 Celebrate the beautiful chemistry behind your drink while you sip with this set of six scientific coasters. From the invigorating buzz of your morning coffee to the hoppy delight of a Friday night beer—are these liquid assets infused with magic? Nope, there's another word for it: Science! Celebrate the beautiful chemistry behind your drink while you sip with scientist-designer Rovena Tey's set of six coasters. Each one features a beverage's molecular structure, from water's elegantly simple formula to the intricate geometry of Theflavin (the antioxidant in tea). Cork backings prevent slips and scratches on your table, and also offer short summaries of the chemistry showcased on the coaster. Great for STEM teachers, dorm room malt researchers, and science-loving hostesses. Made in Toronto, Canada, which overlooks a large body of hydrogen bonded to oxygen.